I couldn’t be happier to learn that Pentax is launching not one, but two excellent new cameras at Photokina today: the K-5 and the formidable medium-format 645D. Why? Because – as long ago as it was now – when I reviewed it for the first time for Digital Photographer, I absolutely loved the K20D. I even toyed with the idea of buying one at the time, that’s how much it impressed me. The build quality was superb, it handled like a dream and the image quality it was capable of producing was nothing short of excellent. The vivid colours that characterised its shots were what really made an impact. Since then – a couple of lower-end models aside – Pentax has gone AWOL in the DSLR market, concentrating on quirky compacts for the most part, before teasing us with a new medium camera that may-or-may-not have only been offered to Japanese consumers. After today’s announcements however, it certainly looks like they’re getting back on track, and I personally can’t wait to try out their latest offerings! Building on the design of the K-7, the new K-5 incorporates the best bits from its predecessor – notably build quality and handling – but adds an impressive set of new features too. It boasts a new 16.2mp CMOS image sensor with PRIME II imaging engine, and an impressive continuous shooting capability of up to 7fps. Add to this a newly expanded ISO sensitivity range spanning ISO 80 – ISO 51200 (when expanded via a custom function) and full HD-proportion movie recording at 1920 x 1080 pixels, and it becomes clear that Pentax has really pulled out the stops when creating the K-5. Full specs at the bottom of the page. Now this one has got to be one of the most hotly anticipated launches from Pentax in a long while. First announced back in March this year, Pentax was previously undecided as to whether to bring their first medium-format digital camera to the UK market or not – and I’m really glad they have! Looking at the specs, the 645D incorporates a lot of Pentax’s solid expertise in the build and handling department gained from their highly successful DSLR models, evidenced by the new camera’s weather-sealing and no-nonsense user interface. Its 40mp sensor is Kodak-developed and it features an 11-point AF system and 77-segment multi-pattern metering. Aside from these headline features, the aspect of the 645D’s specs that leaps out of me the most has to be its 3.0-inch LCD monitor with approximately 921,000 dot resolution. If it lives up to its description, it could offer something quite revolutionary to the medium format market: an LCD that is a joy to use in the field! Incorporating high-performance, hybrid aspherical optical element in its optics, this new standard lens offers exceptional image-resolving power with outstanding brightness levels even at the edges, while compensating various aberrations to a minimum. All lens characteristics are optimized for digital photography: for instance, flare and ghost images are minimized by applying exclusive lens coatings to optical elements and employing anti-reflection materials for the interior of the lens barrel. 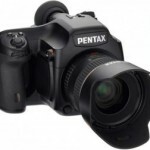 As the result, this lens can bring out the full potential of the PENTAX 645D medium-format digital SLR camera. When mounted on the PENTAX 645D camera body, this standard lens offers a focal length of 43.5mm (in the 35mm format), which produces an angle of view close to that of the human eye. As the result, it can be used for many different kinds of subjects and applications, including landscapes and portraits. Using seven special seals, the lens’ dustproof, weather-resistant construction effectively prevents the intrusion of dust and water to the lens interior. By coupling this lens with the PENTAX 645D camera body, the user is assured of a durable, reliable digital SLR camera system that performs superbly in outdoor settings, even in rain or mist or at locations prone to water splashes or spray. PENTAX plans to use the “AW” (All Weather) designation in the product name of all dustproof, weather-resistant medium-format interchangeable lenses to be marketed in the future. The lens is treated with PENTAX-original Aero Bright coating, which delivers brilliant, high-quality images by preventing annoying flare and ghost images more effectively than ever before. Born as the fruit of PENTAX’s advanced nanotechnology, this exclusive coating effectively reduces lens reflectance and greatly increases light transmittance by forming a silica aerogel layer with uniform pores on the surface of optical element. This is the first PENTAX medium-format interchangeable lens to features a completely rounded diaphragm. It creates a natural, beautiful “bokeh” (out-of-focus rendition), while minimizing the streaking effect of point light sources. * Only manual-focus operation is available when this lens is mounted on the PENTAX 645N or PENTAX 645N II camera body. The front surface of the lens is treated with PENTAX-original SP (Special Protect) coating, which applies an exclusive fluorine compound to the lens surface through a vapor deposition process. This SP coating not only effectively repels dust, water and grease, but also makes it easy to wipe off fingerprints and cosmetics. The K-5 incorporates a newly designed CMOS image sensor with a wide image-sensitive area measuring 23.7mm by 15.7mm. It assures high-speed image data readout much faster than that of previous sensors. 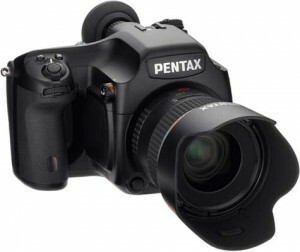 By coupling this image sensor — equivalent in performance and data processing speed to the image sensor incorporated in the PENTAX 645D medium-format digital camera — with the reliable PRIME (PENTAX Real Image Engine) II imaging engine, the K-5 produces super-high-resolution, rich-gradation digital images with 16.28 effective megapixels, while suppressing annoying digital noise to a minimum. The K-5’s high-speed continuous shooting mode records as many as 22 images in a single sequence at a maximum speed of seven images per second. The K-5 features a new-generation, wide-frame SAFOX IX+ autofocus system with 11 sensor points (with nine cross-type sensors positioned in the middle). This sophisticated AF system has completely redesigned optics, and factors the light source at the time of shooting into its calculations to improve the accuracy of autofocus operation. It also offers a choice of shutter-release options — between focus priority and release priority in the AF.S (single) advance mode, or between focus priority and speed priority in the AF.C (continuous) advance mode. The K-5 is also equipped with a spotbeam projector to assist the AF system in poorly lit locations. Despite its compact dimensions, the K-5 is built to be exceptionally solid and durable, with a body of sturdy yet lightweight magnesium alloy, and a chassis of high-rigid stainless steel. Thanks to the inclusion of 77 special seals in the body, it also boasts a dustproof, weather-resistant and cold-resistant construction, assuring reliable operation even under harsh environment and at temperatures as low as -10°C. It also features a reliable shutter unit that provides a top shutter speed of 1/8000 second and tested to 100,000 shutter releases. The K-5 features a pentaprism finder with a nearly 100% field of view and at 0.92-times magnification (with a 50mm F1.4 lens at infinity) to provide a better view of the image field and improve the accuracy and speed of focusing and image composition. It also comes with the renowned Natural-Bright-Matte focusing screen to assist the photographer with manual-focus operation. Thanks to a new image sensor and a more sophisticated algorithm, the K-5’s Contrast AF mode assures better performance and greater focusing speed than before during Live View shooting. With the addition of a Golden Section display, the K-5 offers a choice of three different grid patterns to facilitate image composition. 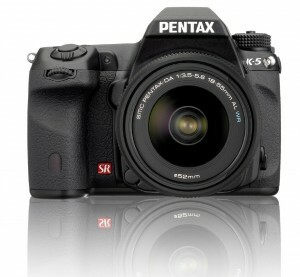 The K-5 features the PENTAX-developed SR (Shake Reduction) mechanism, which effectively compensates the adverse effect of camera shake by 2.5 to 4 shutter steps, to produce sharp, blur-free images. The K-5 captures beautiful, true-to-life movie clips in 16:9 full HD proportions (1920 x 1080 pixels) at a frame rate of 25 frames per second. The K-5 also provides greater possibilities in visual presentation in movies, especially through the application of custom images and digital filters. a) Custom image function for distinctive finishing touches: letting users easily select the desired finishing touch for a particular image. b) Versatile digital filter function: The K-5’s digital filter function allows the user to process recorded images in a variety of creative ways and produce highly individualized visual expressions without requiring a computer. c) Cross process mode with three options: The K-5 features the unique cross process mode, in which the camera automatically shifts photographic parameters for each exposure to create eye-catching images with unique, dramatic colours. d) HDR (High Dynamic Range) function: The K-5 features the HDR (high dynamic range) function to create one composite image with an extra-wide gradation range from three images with different exposures, without requiring a computer. The K-5 will be available from mid-late October 2010.